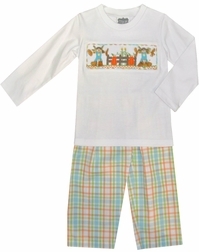 A precious boy's pants set by True for fall, Halloween and Thanksgiving! 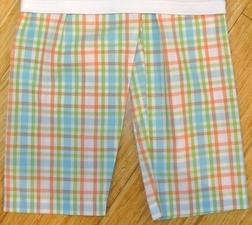 It is made with a colorful fall plaid fabric and with smocking across the shirt. The smocking is hand embroidered with scarecrows (with thread hair!) and pumpkins. We just love it AND it matches sister's dress.